Indian cuisine, known for its spices, chutneys and curries, is also a gold mine of fiber-rich foods. Because of its variety of ingredients and appealing flavors, it's a good choice for both vegetarians and meat eaters. Although dishes vary from region to region, using locally available spices, herbs, vegetables and fruits, and other fiber-rich foods is common to all traditional Indian cuisine. Aromatic, long-grain basmati rice is generally the rice of choice in Indian cuisine. 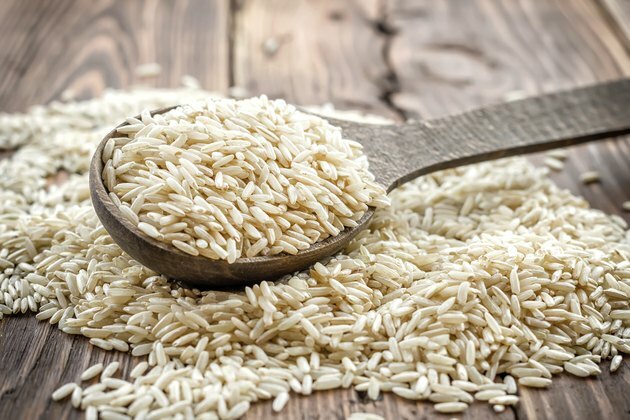 It's available in either a brown or white variety; brown rice contains more fiber. This fiber-rich food is found in spice-filled rice dishes known as pilafs and rice salads, as well as in puddings. In addition, rice is often served with curries, which are strongly spiced meat or vegetable dishes. A 1-cup serving of cooked, long-grain brown rice contains 3.5 grams of dietary fiber. India harvests more than 60 types of lentils and beans, according to Arvinda Chauhan, author of "Healthy Gourmet Indian Cooking." Chauhan notes that most Indian meals are served with a lentil or bean dish. The Indian food term "dal" refers to any split legume. Chickpeas, split peas, mung beans and lentils are fiber-rich legumes often used in Indian recipes. A 1-cup serving of cooked chickpeas, for example, contains 12.5 grams of dietary fiber. Abundant varieties of fiber-rich vegetables grow in India's diverse climate and topography. Because they are so plentiful year-round, vegetables function as a major component of the diet. Spinach, cauliflower, potatoes, peas, pumpkin and sweet potatoes are key ingredients in many dishes. In addition, preserving vegetables is commonplace throughout India. Pickles and relishes, known as chutneys, play a large role in traditional Indian cuisine. Vegetables are loaded with fiber. A 1-cup serving of cooked sweet potato baked in skin, for example, contains 6.6 grams of dietary fiber. Because a bounty of fiber-rich fresh fruits is available throughout the year in India, fruits are included in many dishes. Plantains, mangoes, oranges and coconuts are incorporated into dishes or added to yogurt or curries, and fresh fruit is a common accompaniment to meals. Pickled fruits also play a key role in Indian cuisine. Fiber abounds in fresh fruit. A 1-cup serving of shredded, fresh coconut meat, for example, contains 7.2 grams of dietary fiber. What Type of Food Do the People in India Eat?